It's a Mom Thing Reviews & More! 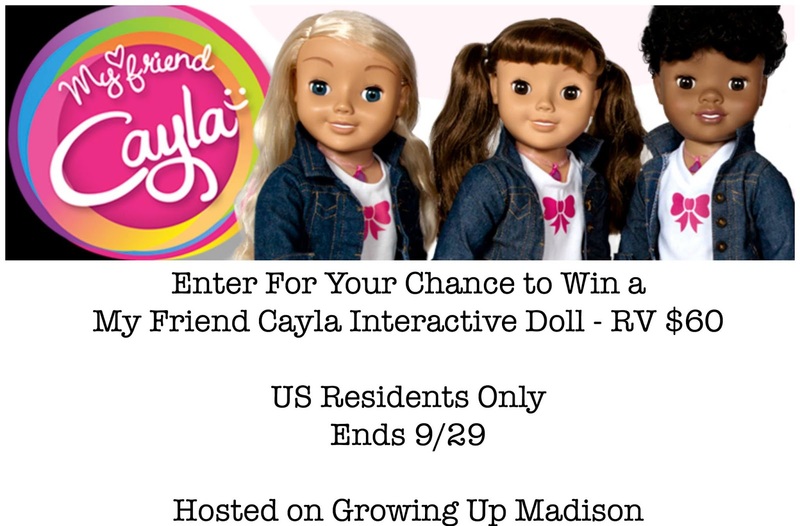 : My Friend Cayla Interactive Doll Giveaway - Hosted by Growing Up Madison! My Friend Cayla Interactive Doll Giveaway - Hosted by Growing Up Madison! Our friends at Growing Up Madison have an amazing giveaway running currently! Enter below for your chance to win a My Friend Cayla doll! This delightful 18" internet-connected fashion doll, My Friend Cayla, can provide your child with hours of imaginative play. In fact, she is more than just a doll you can style and dress, she's a real friend. Download Cayla's free app on your Apple or Android smart device to access more play features. Using voice recognition software, Cayla will understand and reply to your child in real-time about baking, music, math, geography and millions of other things. Cayla plays games, shares her photo library and offers hours of storytelling. She's the smartest and sweetest BFF.